A small yard can be frustrating for a gardener. Creating the illusion of space is easy, however, and can make a small garden feel much larger. Small yards can be frustrating for gardeners. However, a small backyard does not have to be a limitation for creating a beautiful garden. There are many tricks a gardener can use to create the illusion of a larger yard, and there are plenty of creative ways to turn a backyard into a productive and lush flower garden. Using just a few simple visual design tricks can make a backyard feel much larger than it is, and small gardens can be used to add a big splash of color to a small space. Container gardening is a great solution to having a garden in a small backyard. Many types of garden plants can be grown in containers, like sunflowers, begonias, marigolds and many others. A container garden can be arranged and rearranged regularly to create a fresh new look for the garden, and containers are very useful for growing beautiful flowers in a limited amount of space. Choose containers that complement the colors of the flowers and the color of the siding or brick of the house. Containers can be used to emphasize a particular aspect of a home. Line containers around a walkway or place them around a patio or sitting area to create an enclosed area. Combine containers with hanging plants to create an even larger feel for the garden. Choose a focal point in the yard and make it the center of the garden – natural elements like a boulder or tree make a great centerpiece for a garden. If no ideal focal point exists, add a centerpiece and make it the focal point. Honing in on one particular part of a space instead of spreading out a garden creates a larger visual impact, and can compensate for having a smaller garden. Use a decorative boulder, lamppost, sculpture or fountain to create a central visual element. Plant a large number of flowers around the focal point so they act as a small but powerful aesthetic element in a small backyard. A small burst of color can make a big impact in a yard. Plant taller flowers closer to the focal point and put smaller flowers toward the edge to create a visual slope. Encircle the focal point garden with decorative stones or bricks. It is easy to make a small space look like it is much larger than it is. Garden using terraces. Build up soil near a fence or house to create two to three small terraces, and plant along them. Terraces allow more flowers to be planted in a smaller area, making that area seem much larger to the eye. Use brightly colored flowers to add extra impact. 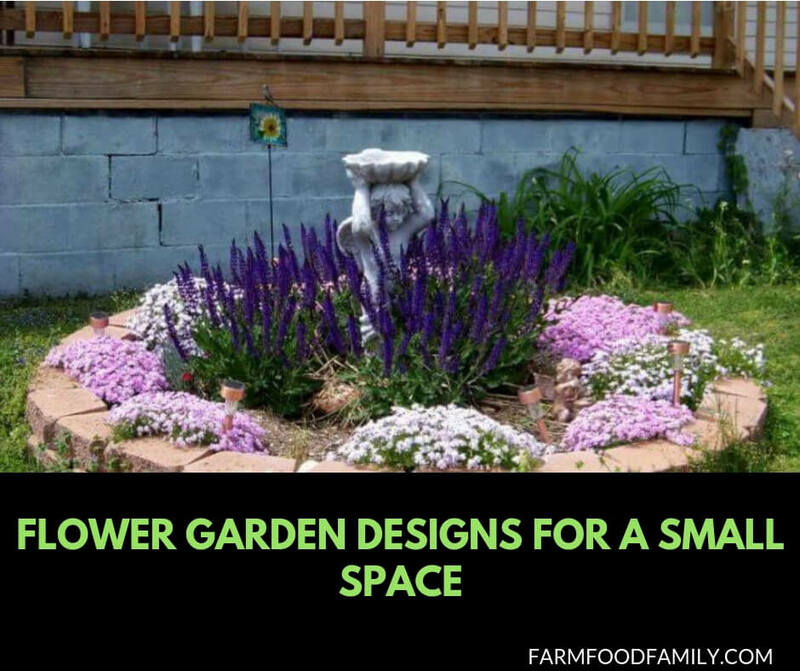 Creating the illusion of space in a backyard is an easy way to make a small flower garden seem bigger than it is. Plant flowers along the house and the border of the yard. Use a curved or wavy border for the garden to make it seem larger than it is. Create a curving walkway along the edge of the garden using decorative rocks or lawn bricks to define the edge of the flower garden and enhance the illusion of space. A small backyard can be a tricky space for gardeners to use in planning and building a garden. Using tricks of color, height and design can make a small yard seem larger. Design a garden in advance so that the careful placement of the flowers reflects the illusion of space or draws the eye to a central focal point in the yard.